Though the city of Baltimore is on lockdown, and I am confined to a curfew, JR the Shark will still lock in his lineup. Like the situation in Charm City, sometimes things are just out of the Sharks control. I finished 12th in last weeks NBA Fanduel. (Please see results below). These results are a bit misleading because of the performance of Mike Dunleavy. The Small Forward posted a Fanduel score of -1 points. In the words of the man, the myth, the legend, Chris Berman @The_ChrisBerman C’mon Man!! If Dunleavy were to drop anywhere around his average the Shark would have finished in the top 5. But hey, if the Shark had last weeks lotto numbers he would be a millionaire. So we cannot talk in hypotheticals. Just like Billy Joel, some teams will be Movin’ Out after these games. The Shark will be playing attention to teams facing elimination and will roll with players that I believe will lead their teams to the next round, or save their teams from being knocked out. How about those minutes? The Spurs have a Socialist mentality with the distribution of their minutes, which it makes it tough for me to incorporate them into my Fanduel lineup. (See their distribution below). This strategy works well for them as a team AKA why the Shark picked them to repeat as World Champions. With that said, be aware of this for Fanduel purposes. This should not come as a surprise. Rose is too much of a competitor to have two terrible games in a row. He will bounce back tonight and lead the Bulls to a win to close out the series. What ankle!? I know he is banged up but with his price that low he is a must play. The Spurs big three always shows up int the big games. They will win tonight with a solid collaborative performance. Joey J is just too consistent. I know exactly where he will score. Expect low to mid 30’s with Fanduel points. He will play a lot of minutes as the Nets look to avoid elimination. I can say I am shocked his price is still where it is. Korver has been a beast this post season. Not only is he hitting his shots but he is also a presence in the paint snagging a bunch of boards. Midd is the offensive focal point of the Bucks. He leads the squad in scoring this post season. With the injury to Carter-Williams, Middleton will get even more looks. I keep taking this guy and he keeps performing. My father always taught me if it ain’t broken, then don’t fix it. Rose to Gasol. 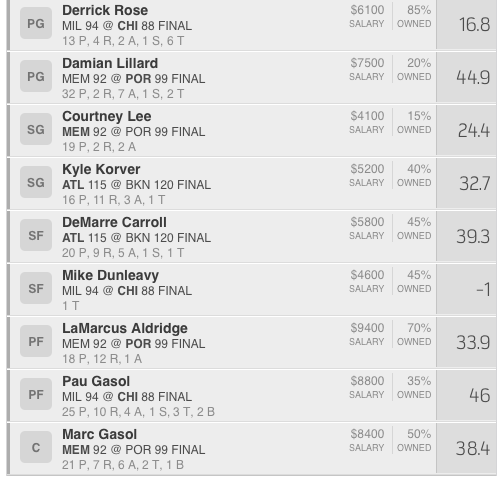 I took both with hopes of doubling up on points when Rose assists Gasol and vice versa. Gasol is the main offensive big man since Noah is a non-factor on that side of the ball. Not Michael, DeAndre. I expect a big night in the paint for him. As the focus keeps shifting towards Griffen, Jordan will be able to capitalize. *Steal of the night. The big boy. 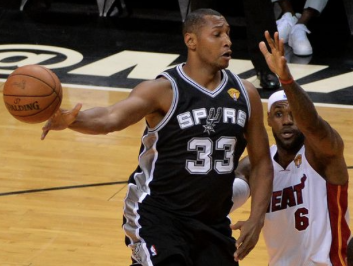 Boris Diaw. I love what I have been seeing from this guy. He has been playing great this post season. The Spurs and coach Pop are utilizing him more because of match-ups. 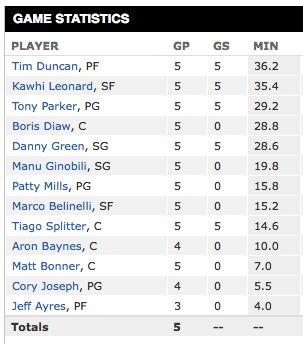 Diaw has been getting a lot of Splitters playing time and I expect that to continue. He will put up a solid performance especially at $5,000. He is so damn versatile. Chris Paul AKA CP3 AKA Cliff Paul is your scrub of the week. Paul is priced at $10,400, this is a bit too much for my liking. Your defending champions, the Spurs, will close this series out at home tonight. The Clippers have been relying on Paul way too much and I see him being fatigued going into tonights game. Spurs win, Paul loses. Coach Silverstein always emphasized a few things in 2nd grade basketball: Rebounding, Foul Shots, and DOUBLE TEAM IN THE PAINT. While we worked on these fundamentals, Coach became an expert at working the refs; who were 6th graders…. By the way the Cold Spring Harbor Lakers took the title that year (our team). Just saying. The word rebound has two definitions. bounce back through the air after hitting a hard surface or object. recover in value, amount, or strength after a previous decrease or decline. This week the Shark will meet both of these requirements. The players in my Fanduel lineup will be a presence in the paint like Dikembe Mutombo. I emphasized big men, realizing they have the most NBA upside in Fanduel. The Fanduel gods are really shining down on us today. Rose has been putting up big performances this entire series and his value is still relatively low. Look for D-Rose to lead Chi-town in a big win at home to close out this series. The Blazers are too good to get swept in this series. They will get a win at home because of improved play from Lillard. They desperately need the Damian from 2014. Maybe last years playoffs will inspire him…. Tres, trios, drie, tria, three. After a subpar game I expect the sharpshooter to explode from three point range. Korver will drop 5-7 from behind the arc. This guy is pretty consistent and well worth his price. He plays his best when he is actively rebounding. He needs to crash the boards to be successful. The intangibles man. Dunleavy is a hybrid, the best of both worlds, peanut butter AND jelly. A big man that shoots threes…. what more could you want? Oh did I mention he also plays 30+ minutes a game? Like Jenny from the block, Gasol has been around the block a time or two. He has been playing like a beast this postseason and expect this to continue at home. I’ve got some good vibrations about Marky Mark. He’s dropped over 38 Fanduel points in every postseason game this year. He is well worth his price. *Steal of the night. Memphis leads this series 3-0. With Mike Conley out for this game, and Tony Allen still banged up, I see Lee getting an expanded roll. I see him scoring well above his Fanduel average of 17.1 Fanduel points. Play Lee to relieve some salary cap. Your scrub of the week is…. Jimmy Butler. He has been playing great lately, which has drastically increased his Fanduel price. Everyone has a bad night or at least a drop off once in a while. This will be Butlers. He is not worth $8,700, I would avoid him at all costs. There is undoubtedly a difference between picking players on a whim and performing the weekly analytics to be successful. Since the Shark has been documenting his picks he has been “in the money” 55% percent of the time. For avid Fanduel”ers” you know this is through the roof. For rookies to Fanduel, you should know this is through the roof. 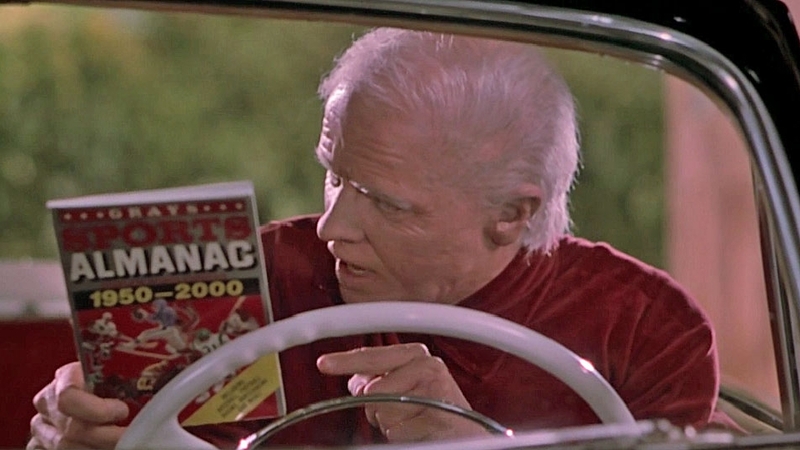 Reading this blog is pretty much comparable to Biff Tannen’s Sports Almanac in Back to the Future Part II. Going forward, the Shark will be mixing up NHL and NBA lineups based on matchup preferences and streaks. If I am seeing success with one of the two I will ride that wave. After being impressed with the effort level in some of the first round NBA playoff games, the Shark will lock in a Fanduel. Are We Actually Talking About Playoffs? Contrary to Jim Mora’s beliefs, yes we are talking about playoffs. In my opinion the NBA regular season and the NBA playoffs (on TNT of course) are two different leagues. Scratch that, they are two different sports. With this said, there are a few points that must be made (some reiterated from NCAA Basketball March Madness). Analyze That- Expect the Sharks results to dramatically improve as the playoffs progress. As stated, the regular season and playoffs are very different. As the sample size for playoff games increases I will be able to factor more statistics into my analytics. The Stars at Night are Bright- In the NBA especially, stars will shine. I will try to factor in guys that typically go off into my Fanduel lineup. Odds are… they will. Zen Master- Matchup’s are vital as usual BUT for a different reason. Expect more blowouts in the NBA. I will take players in anticipation of this. High scoring teams (Western Conference) will see higher over/ unders and players from these teams will score more. Matchup City. Obviously the MVP candidate goes off most of the time, but I think the Warriors will dominate this series. They are just a flat-out better team. Look for Steph to continue to impress. If that’s not convincing enough, watch the video below ASAP. Thing 1, Thing 2. I couldn’t take one splash brother without the other. Klay and Steph are pretty much a guarantee in this series. Gordon is pretty consistent. I take him knowing what I will get in return. He will drop around 20 Fanduel points. At his price this is worth it as the Small Guard position is not too deep in this Fanduel. The Pelicans will need a dark horse if they want to steal a few games in this series. Pondexter had a stellar night in game 1. I will take a shot with him and see if he can go back to back like the Green Bay Packers in 1999-1967. Another consistent guy that will eclipse 20 Fanduel points. I like him because he doesn’t turn the ball over. If he’s feeling aggressive he will also grab some extra rebounds. This will inflate his score. Anthony “The Brow” Davis. The guy is an athletic freak on the rise. He continues to grow as a player and impress the hell out of me. He is very expensive but has the potential to carry your lineup himself. Pay attention to the pre-game shoot around as he is listed as a game time decision. The report says he should play, but I would like to give you the courtesy of letting you know. He has a lot of playoff experience and feels comfortable in the big moments. I think the Bulls will use him over Nikola Mirotic. *Steal of the Night. 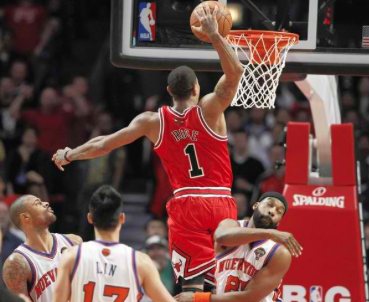 My steal of the night is the one and only Derrick Rose. Yes, he’s a big name, yes everybody knows him. Since returning from injury he has seen consistent improvement, and a consistent increase in minutes. He is clearly undervalued and a MEGA-steal at $6,100. He is a must start. Nikola Mirotic is your scrub of the week. I think the Bulls are too deep for this guy to be utilized. He will receive his typical minutes, but will not see a lot of action. I think he is too inconsistent. As the third highest priced Power Forward, he is not worth it. The tree must fall. Wisco finally met its maker when the Badgers lost to Duke Monday night. That ends March Madness folks; and madness it was. The Sharks first NHL Fanduel lineup was nothing more than mediocre, sorry to disappoint. (See results below.) However, there were a lot of solid picks and there is great upside for the Shark. As Robert Frost said, “Two roads diverged in a yellow wood…” I don’t know what the hell he was talking about but the two roads the Shark is referencing are the start of the NHL and NBA playoffs (both next week). We get to WITNESS (respect to @KingJames) professional basketball players actually try, AND the greatest and most intense playoff race in all sports, the race for the Stanley Cup. Additionally, tune in to the Masters at Augusta this weekend, DraftKings has implemented a lineup for PGA majors, which is pretty cool but my heart and loyalty is with Fanduel. Check out this hype video for the masters below. I will personally guarantee a chill will run down your spine. The Shark learned a few things about Fanduel NHL last week that should be noted in addition to “The Clipboard” guidelines referenced last week. Do not over pay for a goalie. Goaltenders as a whole are priced higher than any other position. For the most part they all perform about the same, unless there is a blowout. The only reason to overspend on this position is a phenomenal matchup. Look for guys who take a lot of shots on goal. This week I tried to use this as one of my main guidelines. Everyone knows I love consistency and this is one of the few statistics that can really be evaluated. This is the last day of the regular season. I incorporated players who are playing for seeding and a playoff spots. I know the effort will be there and inevitably a higher likelihood of performing. Not to be confused with his twin brother, the left winger can flat out play. He has had either a goal or an assist in 7 of his last 10 games. Roll Tide. As a Ranger fan I hate to say it but I like Boston in this one. The Islanders beating the Penguins tonight leaves some hope for the Bruins to make the playoffs. I think they are going to to make a statement against the Lightning on the road. Oh so consistent. He is incredible. Foligno performs every week and has take 5 shots on goal in his last two games. Beck is typically on the 4th line and doesn’t see much ice time. I did need a salary cap reliever and he does take some shots on goal in every game. In a virtually meaningless game I think Beck will see some more playing time as some starters will be rested. My main squeeze. Toews has had a remarkable season and is on fire lately. Expect his success to continue as the playoffs approach. I always have good things to say about this guy. He does it all and gives 110% every night. Can’t wait to watch this guy in the playoffs. I think Keith is a total steal in this one. A Chicago win will move them up in the playoff seeding. 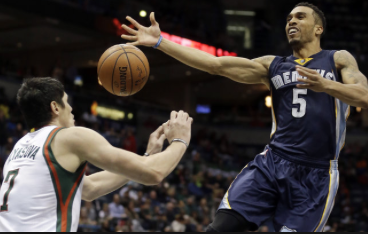 Keith thrives in the playoffs, look for his Fanduel performances to keep increasing. *Steal of the night. Miller will make his first start since February 22 due to injury. The Canucks are facing a terrible Oilers team. 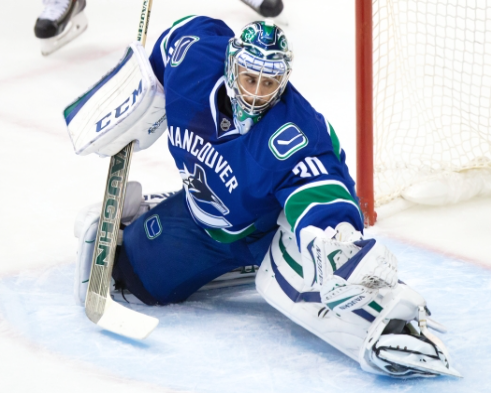 I think Miller will have a great performance to gain some confidence going into the playoff. Everyone knows how good Ryan is when he is healthy. At $8,400 he is a total steal. The scrub of the week is Steven Stamkos. 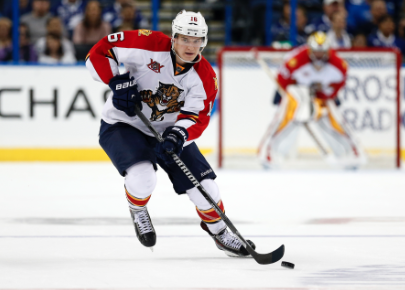 I think Tampa will give him a rest, whether it be a reduction in minutes or him being a healthy scratch. I advise against starting this guy. As Russell Hammond said in Almost Famous, “I AM A GOLDEN GOD!” The Shark is A GOLDEN GOD. The streak continues as JR the Shark finished first, that’s right first in last weeks Fanduel. (See results below). I hope Mrs. Gaffney, my 9th grade english teacher, is reading to see my use of epimone within sentences. My projected steal of the night was Scoochie Smith and he was truly a phenomenal Fanduel player. He dropped 29 Fanduel points, which marks two weeks in a row that my steal of the night has been a monster. The Shark is looking as consistent as Steve Nash at the foul line (name dropped in honor of his recent retirement.) That is three consecutive top three finishes. I am no miracle, I am the Shark. In addition to my recent Fanduel success, my four Final Four teams are still alive (Kentucky, Wisconsin, Michigan State, and Duke). As seen in my previous post, I did pick Wisconsin to be the national champions this year. As of late they have not been looking like their rock solid selves which begs me to ask the same question as Drew Brees “Who Dat?”. Need those boys to step up tonight against the ferocious Arizona defense. Maybe this will pump them up. Please note that this weeks lineup will utilize all the Elite Eight games. Keep in mind there are 2 games Saturday and 2 games Sunday. As you may know by know Hayes is one of my go to guys. Hasn’t let me down yet. He is also a pretty confident guy as you can see in the clip below. Hollis-Jefferson is banged up. This big guy will step up tonight, although the Cats will not win this game. I think he will compete with Kaminsky on the boards. SPARTY! Dawson is a beast and will have a tough time with Harrell, BUT he will prevail. I anticipate a battle more intense than World War I in this game. The other European. I love both of the “Ski’s” tonight. Tarczewski and Karnowski. Both play fundamental basketball and will be needed by their squads. Roll with this guy. That is all. SHOOTER. He will be good for 3 three pointers and has really been playing his best ball as of late. Although he is not as good as the dismissed Chris Jones, he has really become a factor on the Cardinals. I normally shy away from anyone on Kentucky because of lack of minutes, but Ulis actually gets playing time and is pretty consistent. Use this guy to relieve some salary cap. *Steal of the night. 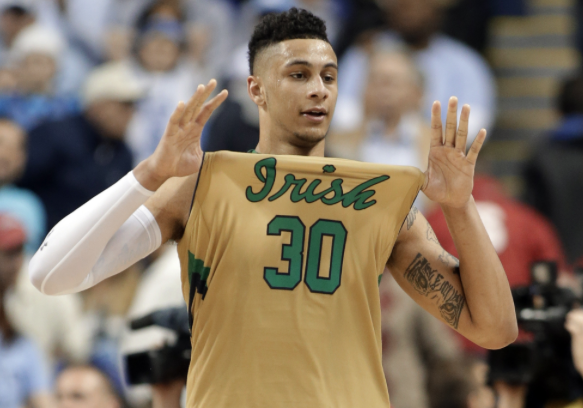 Zach Auguste. The guy plays big and is a presence in the paint. Kentucky will win this game but someone on Notre Dame has to put up numbers. I think he will get his fair share of points and boards as he will likely play a majority of the game to compete with the Kentucky skyscrapers. And the scrub of the week… Rondae Hollis-Jefferson. Wisco will win this game, and RHJ is banged up. Considering the Wisconsin defense this will not be good for him. Yeah he’s a look down defender but there is no Fanduel stat for that. Well, it was back to back solid performances from the Shark. I finished third in last weeks Fanduel, which means I am peaking at the right time. (Please find results below). Like my boys from Wisconsin, I am going into the tournament with confidence. 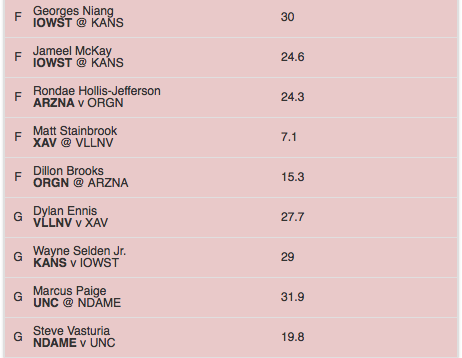 My steal of the night prediction, Wayne Selden Jr., went off like a man possessed with 29 Fanduel points. I watched the game and the guy was unconscious. The Road to Indy- These next few weeks I will bask in glory as the MADNESS is perhaps the greatest time of the year. I am happy to say my Final Four is still alive. JR the Shark has Kentucky, Wisconsin, Michigan State, and Duke moving on to Indianapolis, with Wisco taking out the Blue Devils in the finals. 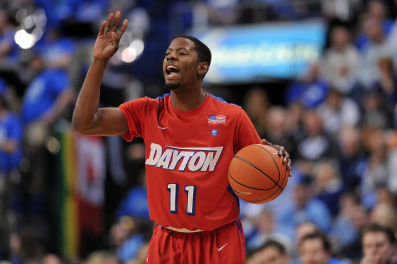 Dayton needs someone to step up in the paint against the hungry Sooners. You know Dyshawn Pierre will get his points, but look for Pollard to be the hustle player in this game. Mr. Reliable. His name gets overshadowed by Kaminsky and Dekker, but Hayes is the key to the Badgers success. The upperclassman shows up every week. I love fundamental basketball. Thats what this guy does. Devin Williams crashes the boards, boxes out, and mentors others. He is the man. Check out this video of Williams teaching teammate Jonathan Holton to box out in the middle of their first round game!! There is never a bad time to learn. I couldn’t decide between teammates Thomas and Spangler. After looking at the stats Thomas has outperformed Spangler and has much more upside. I am rolling with Thomas. So this guy does not play a ton of minutes, but the time he spends on the court is quite impressive. After watching him clean up on the offensive boards in the second round, I knew he was my guy. The leader of the Bulldogs. I actually do not think Gonzaga is a great team, but boy is this guy a great player. He has played two full games in a row. Thats right, 40 minutes. And this guy can shoot the ball. I like him tonight. I splurged on Hield. It was a toss up between him and Terry Rozier of Louisville. Hield is the offensive focal point for the Sooners and I expect him to have a huge night. Though he doesn’t score that much, he is on the floor often. I expect Wisconsin to have a big night and for $5,200 he will be worth it. *Steal of the night. “Scooby” Scoochie Smith is the steal of the night, and not only because I love saying this guys name. Smith has the ability to do it all. The Flyers game against the Sooners tonight will be a close one. I think Smith will be the guy to take a big shot down the stretch. He will also be the X factor in this one if Dayton wants an appearance in the Sweet 16. Joseph Young. As you know by now, I love Wisconsin. Young is really the only offensive threat on Oregon. I think the Badgers will shut this guy down with ease. Even if he does a bit of scoring he will not be worth his $9,900 value. He is overpriced, and will underperform. Wisconsin = utter destruction.